A helpful, often necessary part of any creative endeavor is the ability to import images, PDFs, Objects or other file types into your workspace. 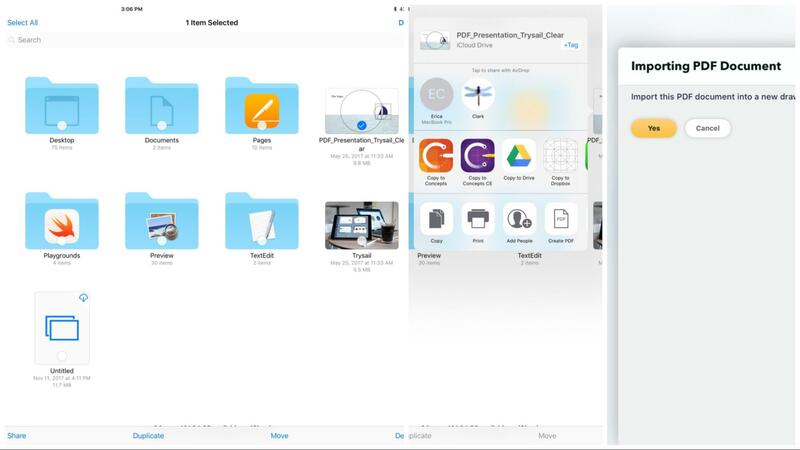 Concepts has multiple ways to help you import files - from working with Apple’s iOS (including Drag & Drop) to import directly into the app, to copy / pasting from your device’s clipboard, to a comprehensive access of all files via the Import menu. On your canvas is an Import button. Tap to expand it into a full menu of your current library of objects, and to find the More button. Tap More to bring up a menu of all imports. Or to quickly open the Import tab, double-tap on the Import button. The Import menu has three tabs: 1 - Market. 2 - My Objects. 3 - Imports. This menu includes three tabs: Market (where you can find all sorts of Objects to help in your workflows), My Objects (your personal collection of objects, including any you have bought, created or shared with someone else), and Imports (all other Import types). 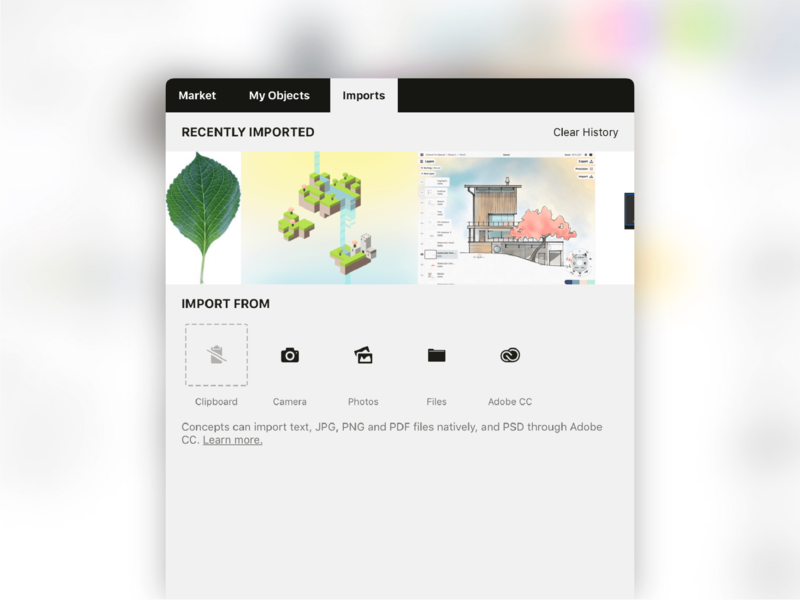 The final Imports tab includes easy access to your 10 most recently imported items, and an Import From selection, where you can access your Clipboard, the device’s Camera, your Photos library, Files, or the Adobe Creative Cloud if you have an account with them. Tip: To quickly open this tab, double tap the import button on canvas (note that this doesn’t work if object list is open). Concepts can import text, JPG, PNG and PDF files natively, and PSD through Adobe CC. Images are imported to scale onto your canvas. 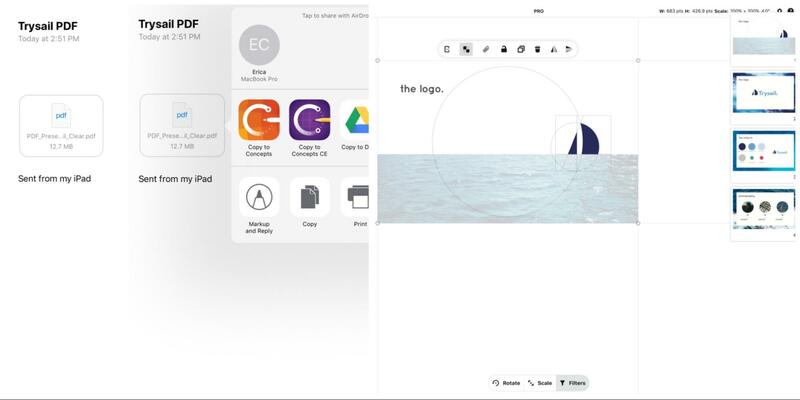 Your device’s clipboard is a handy place to store the occasional image, object, color or selection, and you can access the clipboard from multiple places to import items quickly into your drawing. Access it from the Gallery, from the top of the Objects list under Import, and from the Import menu under More → Imports. Let’s say you’ve just received the latest batch of slides you need mark up in your inbox. Just as you would open the file with any other supported application, download the file to your device, then tap+hold it to bring up sharing locations. Scroll through to Concepts and tap the icon. It will open the file inside a new drawing. Perhaps you have a relevant image or PDF stored in Files. Touch Select in the upper corner of the screen, select your image, touch Share, and scroll to the Concepts icon. Tap “Yes” to accept the import. You can also import via Drag & Drop from any supported app. 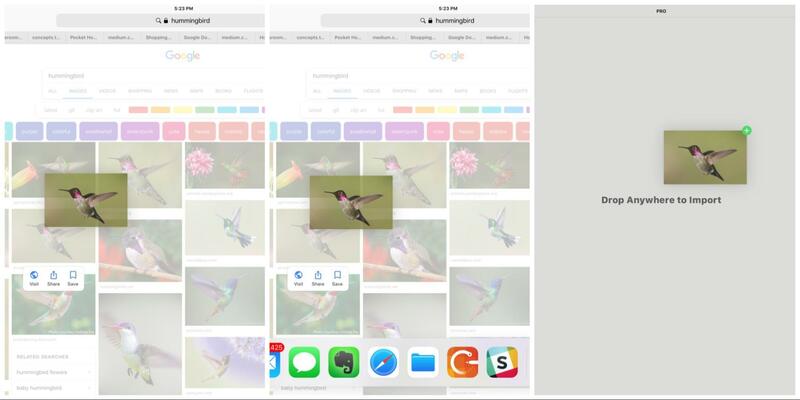 For example, if you find an image you’d like to reference from a Google image search, you can tap+hold the image in the web browser, and drag it straight onto your canvas. You can do the same with colors via supported apps and drag them into your color palettes. Tap-and-hold the image or selected text you’d like to bring into Concepts. Swipe open your dock with another finger and choose Concepts. When you see the green “+” icon, drop your selection onto the canvas. You can also drag colors straight into your color palettes from apps that support iOS 11’s Drag & Drop capability. Note that the interactions will differ between apps, depending on each app’s workflow — you might have to experiment a bit to see what is draggable. Set up Concepts and your other app to appear together on a split screen. Open your color palettes menu in Concepts. 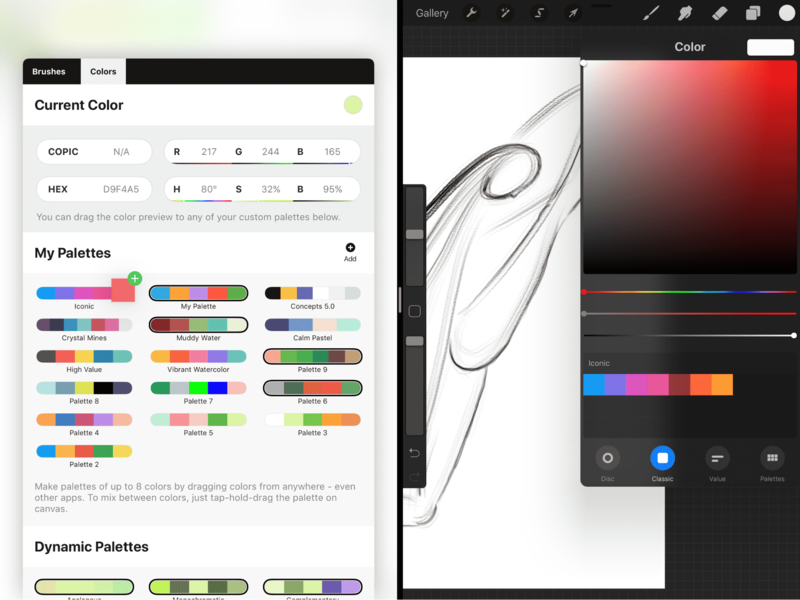 Tap+hold your color of choice from the other app, and drag it straight to your Concepts color palette. 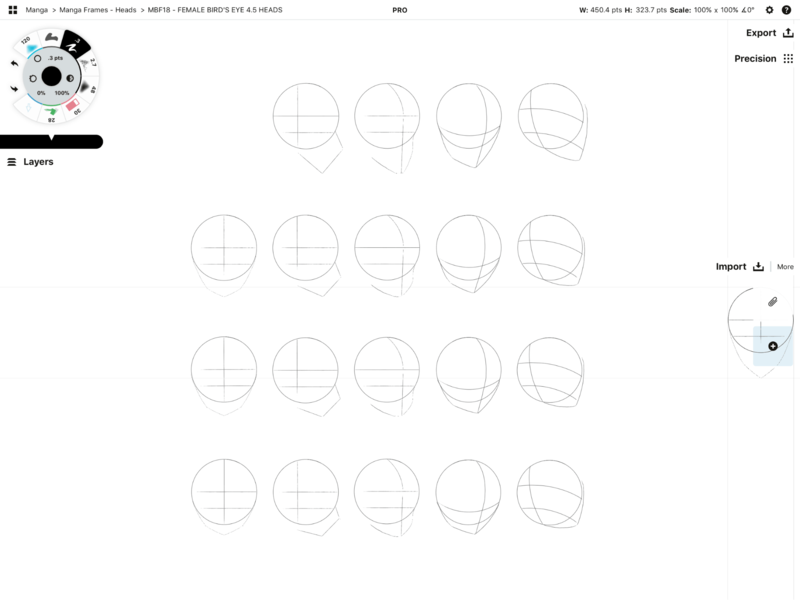 CPT is the Concepts native file type, including all data necessary to work with the drawing further in Concepts. 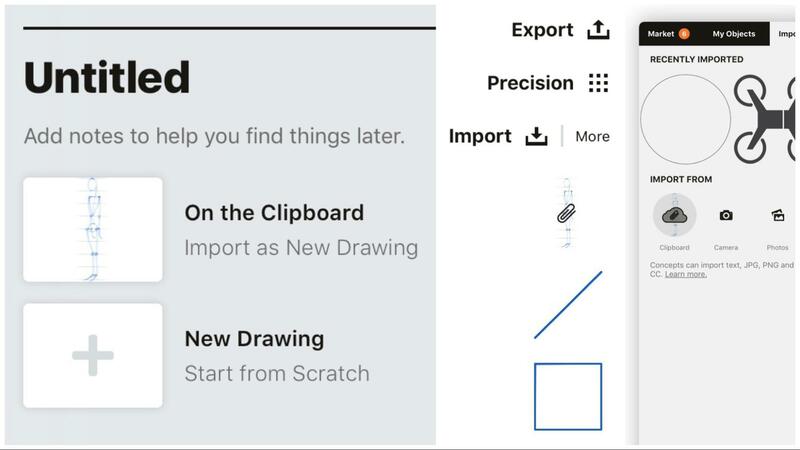 You can import CPT files just like any other compatible files; open them from the import menu or go to your Files app and select “Copy to Concepts.” You may also receive a Direct Link that allows you to open a drawing by clicking on that link. To learn how to share drawings like this, see Exporting a CPT File. In Concepts, objects are your ultimate, super-powered stickers. Royalty-free and 100% vector adjustable, you can Drag & Drop them straight onto your canvas from the Import menu and cut your workload into a fragment of the time. 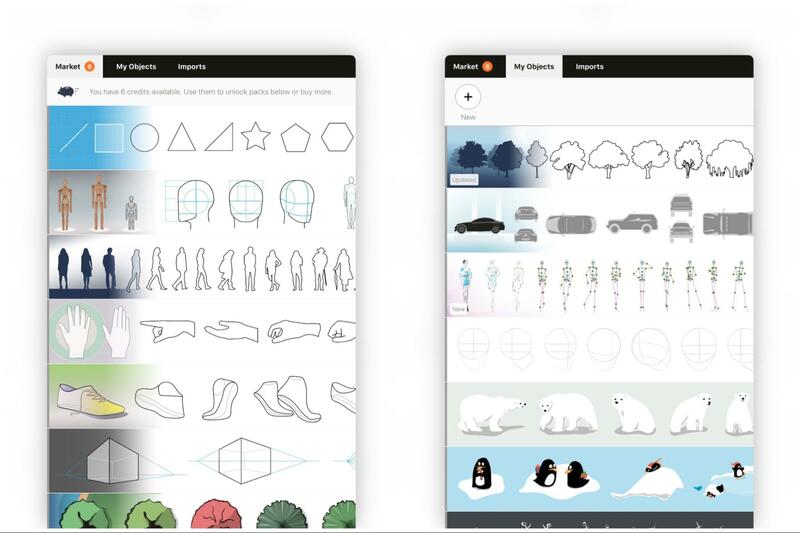 Purchase pre-made objects for any workflow from our Market, create infinite libraries of your own objects with Make Your Own Objects (MYOO), or Share your object libraries with colleagues to help your collaboration efforts. Tap the Import button on your workspace to bring up a menu of your current objects. To switch to an alternate library of objects, tap the More button and you’ll be taken to the Import menu. Here you can find the Market tab with pre-made objects for different workflows available for purchase, and the My Objects tab, where all the objects you’ve purchased and created live, as well as libraries your colleagues have shared with you. When you purchase object packs from the Market, you’ll find the option to buy bundles of 3, 5 or 10 packs in the Pro Shop. A bundled purchase places Credits on your account, which you can redeem for packs. If not used, they remain on your account, redeemable at any time. We update our Market often according to our community’s feedback. Is there an object pack you’d like to have that you don’t see? Let us know. Once you’ve purchased the object pack, it will appear under your My Objects tab. Just tap on a pack to activate it on your canvas, and find it under the open Import menu. Tap+hold+drag on a pack to rearrange its position in the menu. 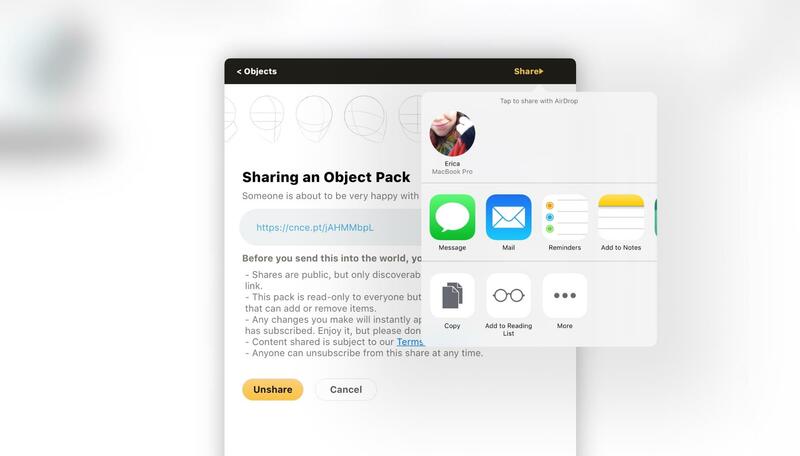 Tap+hold on a pack in My Objects to Edit, Delete,orShare your object library. When you choose to edit your pack, a popup will appear where you can name, describe, and add search tags to your object pack. (Find the Searchfield at the top of the My Objects tab for quick searching through pack names, object names, and tags.) Object packs that are bought from the market or have been shared with you by others are read-only and cannot be edited in any way. You can create your own libraries of Objects with anything you draw. To create an object, make sure you’ve purchased MYOO from the Objects Market. 1. 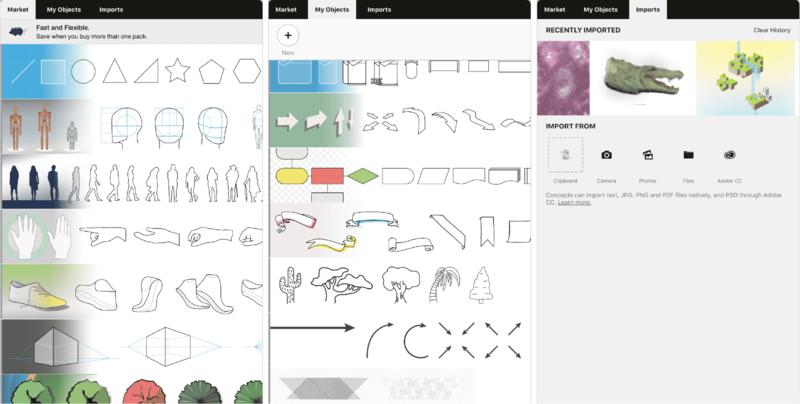 To create a new object pack, touch the New + button at the top of the My Objects tab. You’ll be taken back to the canvas where you’ll find a nearly empty library under the Import menu. It will contain a paperclip (access to the Clipboard) and a + button. 2. Select your drawing. We recommend grouping your strokes into a single object (by touching the chain link on the popup) so that selecting it later is easy. 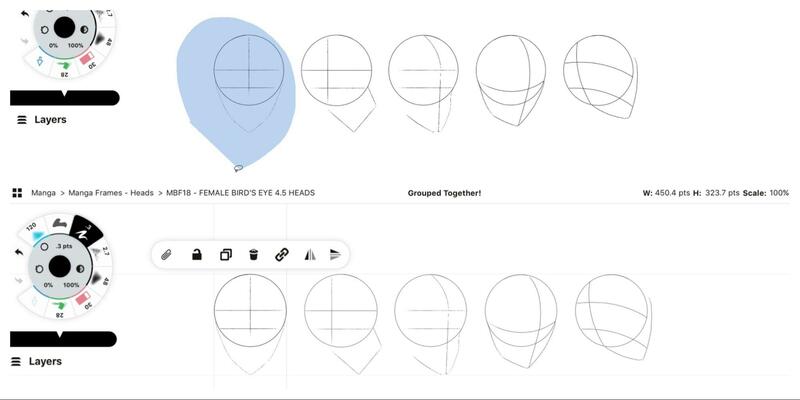 You can always ungroup it to adjust individual elements down the line. 3. Tap the + button on the object pack. Alternatively, you can drag your selection anywhere on the object pack and then let go. It will add itself to the pack while your original slides back to its position on your canvas. 4. Tap+hold the object on the pack to Edit or Delete your object. Giving it a name will help you to search for it from your object packs, and will keep them clear for your colleagues when shared. When you drag the object onto the screen, its name will appear for reference, and once added to the canvas, the object will appear at the original scale it was added into the object pack. If you’d like to share an object pack with a colleague who has also subscribed to team-sharing, go to the My Objects tab in the Import menu. Tap+hold your object pack to select it, and touch Share. You’ll be given a Direct Link that you can copy to your device’s Clipboard, or just tap Share in the upper right corner. Choose your destination and share the link. When you or your colleague touch a link and open it in your app, it will ask if you’d like to accept the object pack. Accept it, then find the pack in your My Objects tab in the Import menu. Troubleshooting. If for some reason you can’t find the object pack, log out of your account via your profile icon and log back in, and the object pack will appear. You can also Ask Us Anything in app via the question mark on the status bar. Your object pack is read-only to everyone except you. You are the only one who can add, rename or remove objects, or rename the pack. Any object pack that you have created, you can share. Content shared is subject to our Terms of Services. We think you’ll find a substantial and enjoyable amount of value in creating and sharing your object packs - time savers plus fun for everyone. Concepts works with iMessage directly to display your objects as stickers for your text messages. Allow iMessage to use Concepts. Apple has a quick how-to here. In iMessage, choose Concepts, and tap one of the object packs at the top of the Sticker menu. Tap a sticker and send it. For importing PDFs, please see PDF.